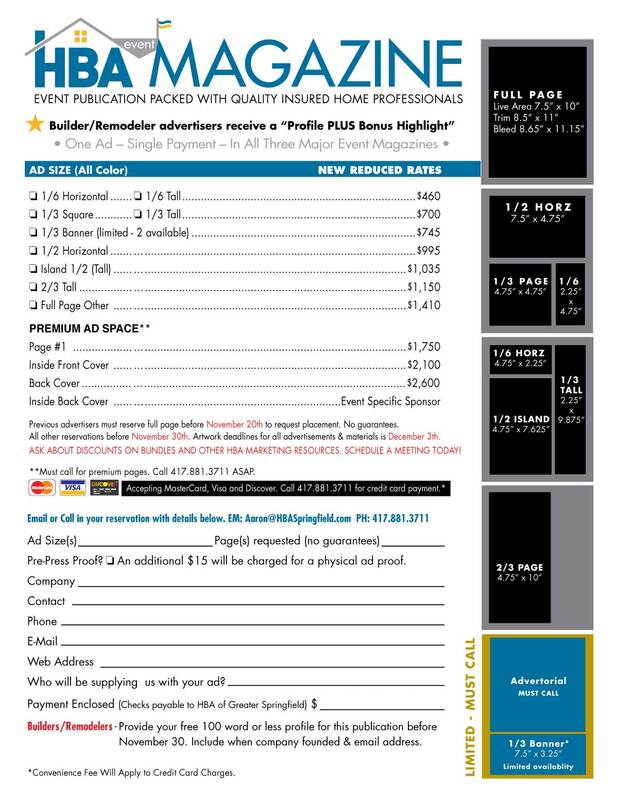 The HBA Event Magazine has always been a keepsake for those attending the Home Show, Parade of Homes or Remodeling EXPO. Fun covers, event specific information, articles, builder profiles and the membership guide all make this a very useful resource for anyone with a home or considering buying or building a home. FACT: Focus Group research showed that most keep the magazine for the Membership Guide section. This year, we want to reach more than those attending the Home Show by having the publication printed and ready for members to hand out at their showrooms, by January 21st (at the latest). If you would like to be a distribution sponsor ($100), please let us know ASAP. In order to accomplish this feat, we need all advertisers to reserve ad space before November 30th and supply all print ready ads before December 3rd. If you are needing an ad created for you, please submit all photos and content for creation before November 3oth. BUILDERS: Submit your FREE Builder Profile (100 words or less) before November 30th. Check your current profile (click here). Previous advertisers must reserve their ad space before November 20th for an opportunity to keep previous year's placement. No guarantees on requested page placement! If you have received your bundle proposal, please make your modifications and submit final bundle before November 27th. If you have not received a bundle proposal, and would like one, you must request a proposal before 5:00pm on November 19th. Contact Aaron@HBASpringfield.com or call 881.3711 to reserve your space ASAP or if you are interested in a bundle. HINT: If you reserve magazine ad space you will at least save 6% by having a bundle.